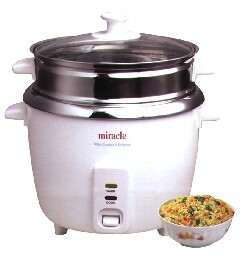 The Miracle stainless steel rice cooker. Our family has used this rice cooker for years and love it! We are proud to finally be able to offer it to our customers. This incredible 8 cup rice cooker will yield a full 12 cups of cooked white or brown rice. Cooks rice automatically and then switches to a stay warm mode when rice is fully cooked, keeping rice warm for hours. The inner cooking bowl is a beautiful solid mirror finish stainless steel. The glass lid allows you to view the rice or vegetables while cooking and the easy view indicator lights identify cooking modes.. Also comes with a vegetable steamer tray, measuring cup and rice paddle! ****BACK IN STOCK AT LAST!!!!!!! !